Movistar Yamaha MotoGP riders Jorge Lorenzo and Valentino Rossi continued their momentum at Circuit de la Comunitat Valenciana – Ricardo today, finishing the second day of testing in fifth and seventh place respectively. Movistar Yamaha MotoGP’s Jorge Lorenzo and Valentino Rossi headed out on Circuit de la Comunitat Valenciana – Ricardo Tormo this morning and were able to make a big step in the afternoon as they tested the 2016 YZR-M1 machines, with the fuel tank on the back of the bike, new front forks and the mandatory electronic software for next year’s season. Following the same procedures as yesterday, Lorenzo was the first of the Movistar Yamaha MotoGP team-mates to make his way out on track. It didn’t take him long before he confirmed his key protagonist status as he briefly took over the top spot. He spent the majority of the day on his 2016 bike and completed a total of 48 laps. Throughout the day the Spaniard bettered his time to a 1’31.282s on his penultimate lap to complete the day in fifth place, 0.222s off the front. 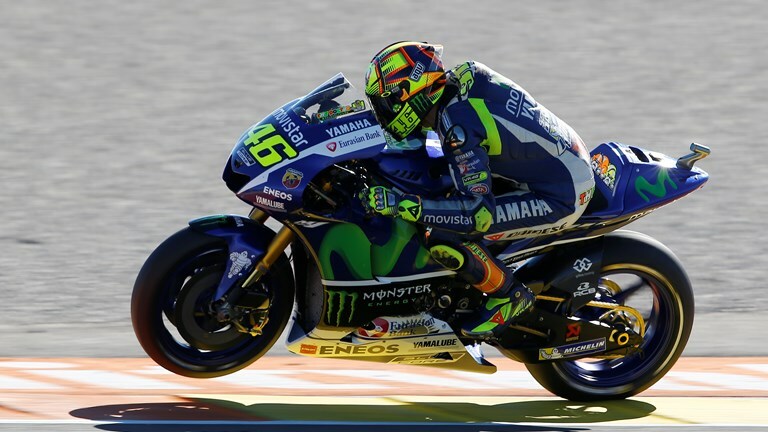 Team-mate Rossi also had a productive second day of testing. He energetically tackled every item on today’s schedule and completed more than two full race distances. As the day progressed he adjusted the settings of his bikes to match the Michelin tyres and clocked a personal best lap of 1’31.498 on lap 57, moving him up to sixth place, 0.438s from first. Rather than focusing on bettering his time, the Doctor ended the day collecting valuable data with a steady final run on the 2016 machine and was pushed back to seventh place by a late flurry of activity. Today’s results secured Lorenzo and Rossi fifth and seventh place respectively in the overall combined practice times. They now look forward to returning home for a well-deserved break during the winter stop after a long season and hard work during the Valencia test. Monster Yamaha Tech3 Team rider Pol Espargaro successfully wrapped up his final appearance on track for the year at the Ricardo Tormo circuit today with a run to 8th position. The Spaniard partially sampled his new Yamaha YZR-M1 MotoGP bike for the 2016 season and continued his work with the Michelin tyres in order to start collecting valuable information for next year. Espargaro’s best time of 1’31.619, which he set on his penultimate lap, saw him close the test in 9th place in the combined standings, which a gap of just over half a second to the time at the top of the field. Meanwhile, Bradley Smith began his in-depth and methodical work with his new MotoGP bike for the forthcoming year whilst also continuing to the test the Michelin tyres. The Briton rode relentlessly and eventually completed more laps around the circuit than any other MotoGP rider today, outlining his intent to understand his new Yamaha YZR-M1 as well as the tyres fully. He set a personal best time of 1’31.694 which was only 0.075 from his teammate and now the 24 year old rider confidently awaits the next outing at the three day Sepang Test in February.